Imagine that the main drag in your town had a furniture store that was full of love seats, side tables, and faux floral displays, but never, ever opened its doors. How many failed shopping trips would it take before you realized something was up, and how much weed would you guess it was hiding in back? In the case of Gilroy Furniture & More in Gilroy, CA, the correct answer to the second part of that question is "enough to keep a gang of teen boys busy for the rest of their lives." According to the Santa Clara County Sheriff's Department, the store on Monterey Road "was never open for business—in fact none of the furniture was even for sale." 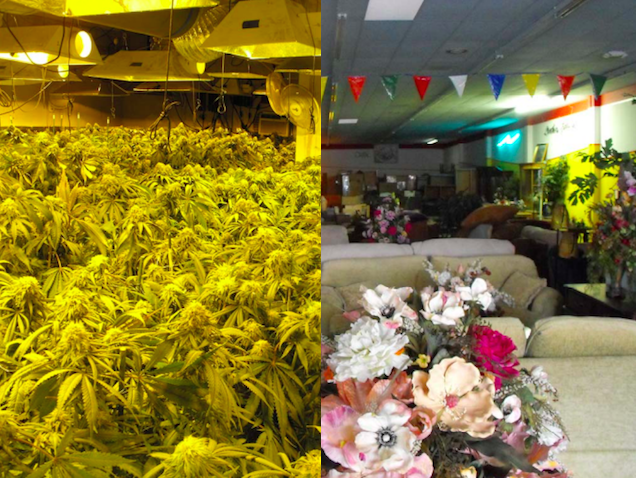 Instead, owner Phuc Nguyen—arrested in the store last week—operated in back, where he allegedly kept 1,000 cannabis plants and 50 pounds of processed weed, the total value of which the department estimated at $2 million. The sheriff's press release also alleges that Nguyen powered his grow operation with $80,000 of stolen electricity obtained by bypassing the meter. It's unclear how long Nguyen allegedly operated out of the storefront before he was found out, and what's most intriguing about the story is how he was able to operate at all. A Yellow Pages entry for Gilroy Furniture & More puts it at 7542 Monterey Road—on a block that looks more like a quaint, thriving main street on Google Maps than a seedy back alley. Did it arouse suspicion from the neighbors? I called and asked an employee at a nearby bowling alley, who said that the store didn't arouse any particular suspicion because many of the storefronts in the area are vacant. (Maybe things have gotten bleaker since the Streetview car came through?) "Yeah, it just seemed like an old furniture store," he said. "I don't think it was ever open. Nothing's really open down here." Do you live in Gilroy? Do you do drugs? Was it well known that the "& More" in "Gilroy Furniture & More meant weed? Send me an email or leave a comment below.